Currently rated No.2 in South Africa the championship Gary Player Country Club is the venue for the annual Nedbank Challenge competed for by a select group of top world ranked golf professionals. Jim Furyk won back to back events in 2005 & 2006 and joined the ranks of other former winners who include Ernie Els, Sevvy Ballesteros, Johhny Miller, Ray Floyd, Bernhard Langer, Nick Faldo, Ian Woosnam, David Frost, Sergio Garcia and three times winner Nick Price. 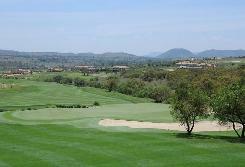 The Gary Player Country Club is acknowledged as a difficult and demanding course and requires stamina and accuracy from players. (See our News and Views section for course closure dates). The comparatively flat nature of the golf course is misleading - water hazards, cunningly sited bunkers and pins hidden away on kidney shaped greens makes up for the lack of gradient. Off the back markers the course measures over 7 000 metres which makes it one of the longest in the world. 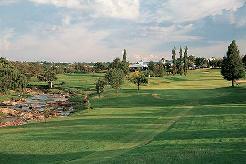 But a variety of tees make it possible to shorten the course and render it playable for all levels of golfers. A distinguishing feature of the course is its green's complexes - strategically placed bunkers, swales and mounds protect the super slick clover shaped greens. 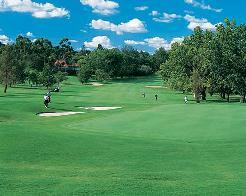 With pristine perfect kikuyu fairways and excellent bent grass greens the course is kept in perfect condition all year round. With a normally warm to hot climate, it is essential to take plenty of drinking water with you when playing this layout and you are well advised to keep your ball on the fairway - the kikuyu rough is thick. This is a must-play Golf Connoisseur's course. Signature Hole: Well they're all good at the Gary Player Country Club, but for risk and reward the stand-out is the 9th. Play this par 5 from the forward tees and then have a go for the island green with your second and thrill to the challenge of this superb test of golf.